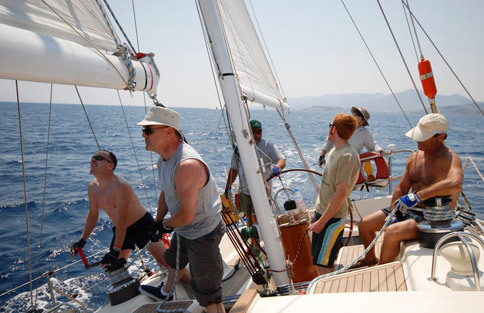 AN ENGLISH YACHT CHARTER GREECE COMPANY OFFERING SAILING HOLIDAYS, AND YACHT CHARTER IN GREECE AND THE GREEK ISLANDS. Cabin Charter offers the chance for couples or singles to share a large yacht for a cost far less than the whole. However you will have to become part of the crew and share yacht chores, these trips are are best described as luxury camping around the Greek islands. Cabin charter is for the adventurous type, we can not emphasis enough that these cruises are for the down to earth type, not for the cruise ship type. Life on board will be active and challenging as you assist with operating the yacht. Everyone has a say in where the yacht goes, and often you can choose the islands to visit. We use 2 of our larger yachts that have cabins with en-suite facilities, and plenty of storage space. All the cabin cruises start and finish on Poros Island, the duration of the cruises are normally 7-10 days. TOO OBTAIN MORE DETAILS PLEASE E-MAIL US.